Orange HOWELL designs, develops and markets luminous gifts of original American craftsmanship to celebrate Homes, Holidays, Weddings & LOVE. Jewelry, Giftware, such as tree ornament collections: Snowflakes and O.H.Macaroni all originally made inManhattan and New England H.U.B. zones. O.H.Textiles, O.H.Sterling and all O.H. things creative! Orange HOWELL was the given name of the founder’s Spirited Great, Great, Grandfather, “Seventh Son of a Seventh Son” Welsh, Quaker, Hoosier, Farmer. Founded in April 2009, beginning with Snowflake Ornaments for Neiman Marcus, our gift items focus on holiday and wedding celebrations, with options for private label, corporate and custom. Orange L. W. Howell, a spirited person of 157 years who occasionally moonlights in luxury retail, lives passionately in New York City's East Village neighborhood of Manhattan. Orange L. W. Howell is my name and @ 157 years old I can assure you I speak with opinions in their various shades of gray. Black n' white thinking is fools talk, easily palatable for most folks, but then most don't live past 90 before they can't think right. About the name +color, "William & Mary of Orange" I was born in 1861 the year the Civil War began. Eighth generation American, Quaker, Hoosier, Welsh, originally a Farmer. I grew up Henry County, Blountsville, Indiana. Parents were Hilary Howell and Fanny Bedwell-Howell, and my first lovely wife was named Ella Chamness, we had four children. Everyone is in the ground. Coffee Talk: On Easter Sunday I gave the hard working Barista Bunnies (Lauren & Ally) each an O.H.Macaroni Pendant strung on Licorice Studded Leather...inspired by ol' East Village Italian spots and early everything. Precious metal meets precious children, the underepinnings of Orange HOWELL's O.H.Macaroni Jewelry Collection. Jeanne knew the real deal and told it like it was. Beloved Pasta Art has deep meaning. Prompted by my polite request, this exceptional cool lady of the west, emailed attic pictures, along with her STORY, "Pasta Memories". The real deal exchange, a hug everytime I see her daughter Lauren ... everpresent mother LOVE. Jeanne Falulkner is a Registered Nurse and Senior Writer for the non-profit Every Mother Counts, founded by Christy Turlington Burns. I remember the day when I graduated from paste to glue and the day I was introduced to the mother-of-all craft supplies – spray paint. It was the week before Mother’s Day and I was in the third grade. The project involved an empty orange juice can, glue, gold spray paint and macaroni. This memory is from so long ago, that juice cans were made of tin, not cardboard and the only types of pasta you could buy were spaghetti, lasagna and macaroni. I remember the light coming through the classroom windows, the stern warning from the nuns not to get glue or paint on my plaid uniform and the smell of bologna sandwiches wafting from someone’s lunch box. It was a big day and I remember feeling like I’d arrived. 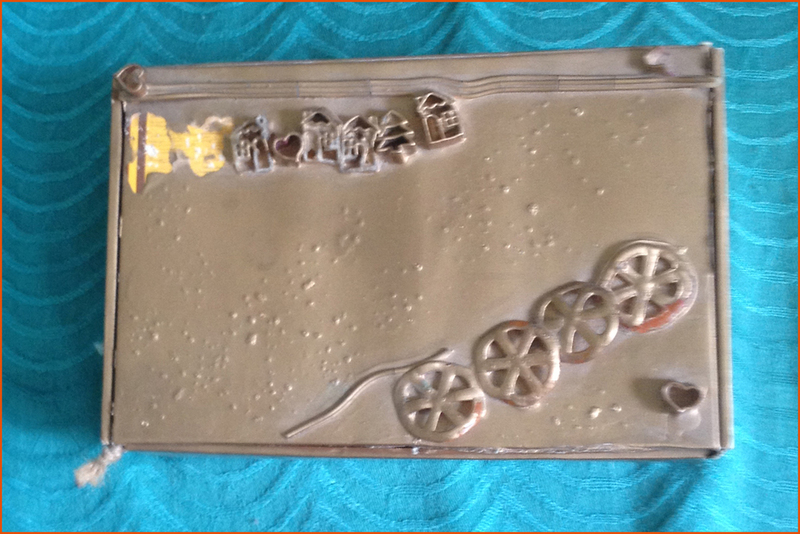 I was finally old enough for a big kid craft - a gorgeous 100% solid gold macaroni-encrusted pencil holder. It never occurred to me that my mom had probably been gifted dozens of these holders over the years made by my seven older siblings. I have no memory at all of actually making the pencil holder or of giving it to my mother. I don’t remember ever seeing it on our telephone table or her dresser. My memory is cast in the pure potential the craft and gift held; in the beauty of the paint, the maturity of the glue and the cleverness of crafting with pasta. I filed that memory away and didn’t dust it off again until decades later when my oldest daughter was in preschool. On my third Mother’s Day I was given a gift of such beauty and simplicity that it humbled me. She gave me a string of thick rigatoni noodles, carefully strung on a shoelace and scribbled with colored markers. My daughter was achingly proud of herself as she placed it around my neck with absolute certainty that I’d wear it daily for time eternal. Beloved Treasures...from Jeanne Faulkner's Portland attic *Note Rotelli wiht Spaghetti accent. As other children marched through their preschool and elementary years, I was gifted with other pasta necklaces plus pasta rings and earrings made from sharp brittle noodles laced onto gardening wire. I happily endured green fingers and came up with a brilliant way to attach the garden-wire earrings onto gold hoops that wouldn’t infect my piercings. I wore that jewelry with pride, for as long as my children needed me to. When I’d show up at work bedecked with pasta, every mother I encountered nodded and smiled and admired my collection. They knew. They had their own pasta accoutrement. They had their own memories of proud preschoolers and green fingers. My youngest daughter added the last piece to my pasta jewelry collection. She made it in preschool and was thrilled to have a secret to keep from me. At that age, however, keeping a secret simply meant telling me what she was making for my birthday present in a whisper. She whispered to me about the gold spray paint, the real glue and the cigar box she was bedazzling with pasta to make me a jewelry box. When she presented it to me, it never occurred to her that it wouldn’t be a complete surprise. Today, that jewelry box sits on a highly visible shelf in my closet filled with buttons I’ve collected over the years. The pasta necklaces and rings sit in another jewelry box with my mother’s jewels and my grandmother’s rings among my most beloved treasures.